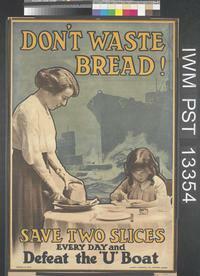 Austerity Britain in 1914-15: from war economy to radium bread. Copyright. Imperial War Museum. http://www.iwm.org.uk/collections/item/object/31468. The poster dates from 1917, and illustrates a later phase of what came to be known as voluntary food rationing. 1919 W. B. Yeats Cutting of Agate 16 The Print Room of the British Museum is now closed as a war-economy. While the OED’s entry for war was written in 1921, war-economy would make its way into the dictionary only in the final volume of the four Supplements edited by Robert Burchfield between 1972 and 1986. Dated to 1919, the earliest evidence, as in extract given above, derived from the poet W. B. Yeats. War economy, and the exigencies of conflict as experienced on the Home Front, has, however, a far earlier history as detailed in the Words in War-time archive. Prominent from the autumn of 1914, it can, as the archive confirms, prompt a wide range of associated forms. 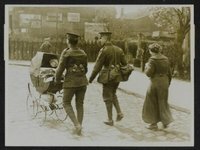 Writing the refugee in WW1: language, identity, and use. Refugee was to be another prominent word in the Words in War-Time archive. This had, in fact, been another relatively recent entry in the Oxford English Dictionary. Published in 1905, the entry had tracked usage from 1685 to 1879. Yet a conspicuous absence attended refugee as used in the context of war. In the OED as it then existed, refugees sought a place of safety as a result of religious or political persecution; historical examples in the Dictionary made reference to the French Hugeunots who came to England in 1685 (after the Revocation of the Edict of Nantes) and refugees who emerged after the ‘American revolutionary war’ and who ‘claimed British protection’. Various sub-senses documented refugee as used with reference to migrating birds, or to mean a fugitive, or to indicate someone who was simply running away from justice.